I've still got my cold, and was tempted to skip the blog again this morning. After all, what worse combination is there than a cold on Friday the 13th? Alas, I dragged myself out of bed and forced myself to do this. Let's all have a round of pity for poor, poor me. (Anybody know where I can get cheap Kleenex? I'm going through a lot.) I managed to do my two hours of coaching last night, but am not sure about tonight's 2.5 hours scheduled. 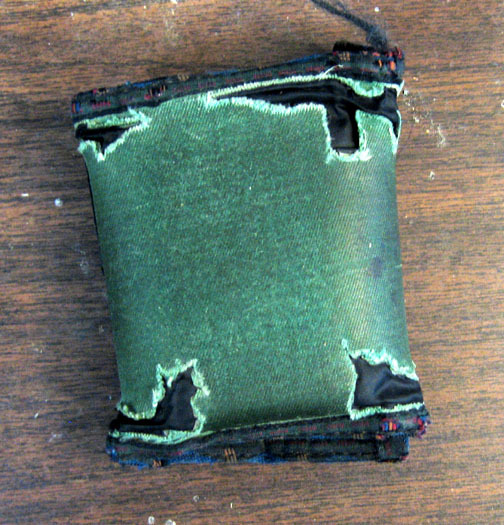 Since I'm feeling very old right now due to my cold, I thought I'd tell the story of my wallet, which turns 32 years old this month. This is only peripherally table tennis related, but since it's a source of legend among the locals, I might as well tell the story. In September of 1981, when I was 21 years old, I started classes at University of Maryland. (I'd taken two years off to train for table tennis in North Carolina.) On the very first day I went to the Student Union for lunch, where there were a number of restaurants. I went to the pizza place. When I reached the front of the line I ordered a pepperoni pizza, pulled out my wallet, and paid. As I handed the cashier the cash, I placed the wallet on the counter for a few seconds. When I reached for it, it was gone. I looked around, but couldn't find it. Someone behind me said, "Excuse me, was that your wallet on the counter?" I said yes. The person said someone had just picked it up and left. I ran out into the hallway, but I never saw the wallet again. That afternoon I bought a new one, and vowed it would last me a lifetime. That was 32 years ago, and I still have the same wallet. 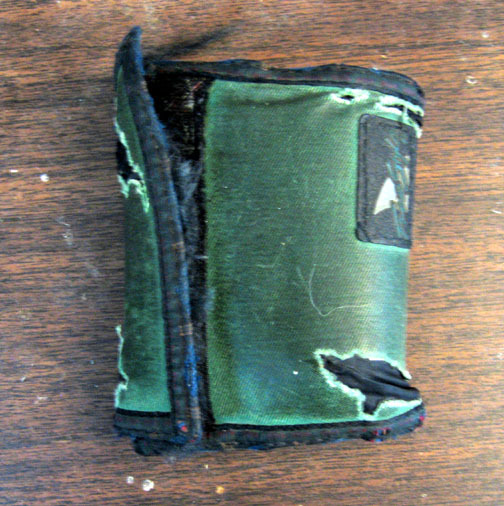 It's rather beat up, with several holes, including one in the change purse. (I have to be careful or coins fall out.) The Velcro that closes it is almost gone, but there's still a tiny bit that sort of keeps it closed. Anyway, this month is the 32nd anniversary of someone stealing my wallet, and it's never happened again. Here are two pictures of this ancient wallet, top and bottom. Actually, it's been a long time since I've had anything stolen - the playing bag and laptops were both stolen in the 1990s. Maybe I've learned to be more protective of my stuff. Here's a video interview (8:57) with Coach Karsai, coach of 2003 World Champion Werner Schlager of Austria, the last European World Singles Champion. He talks about talent in table tennis and working with Schlager. In honor of Friday the 13th, here's Creepy Pong - see how many Halloween ghouls you can beat at table tennis! I couldn't get it to work in Chrome, but it worked fine in Explorer. It starts with an irritating 30-second Power Rangers ad. Note that when you do play, you can hit the ball harder by moving the cursor in as you hit; otherwise you'll just rally and never score.